When DJ Spinna and Kriminul met, and founded Jigmastas in Brooklyn in 1991, little did they realise that their musical partnership would last twenty-five years. To celebrate this anniversary, Jigmastas have released an album of previously unreleased material Resurgence. It’s just been released by BBE Records, which has been home to Jigmastas for several years. During that period, Jigmastas have written their place into hip hop history. It began in the late sixties. Hip hop’s birthplace was the Bronx, one of the five boroughs of New York. That was where hip hop was born in the late sixties. Its founding fathers were groups of African American and Latin American youths. This includes the Ghetto Brothers. They plugged the amplifiers for their instruments into the lampposts on 163rd Street and Prospect Avenue. Soon, music was being cranked out of their speakers. However, this was no ordinary music. The music the Ghetto Brothers played was credited with breaking down racial barriers. It also had a social conscience, The Ghetto Brothers were involved with Puerto Rican independence, and the nascent Puerto Rican Socialist Party. Like future hip hoppers, they were determined to make a difference, and used their music to do so. Despite the importance of the music the Ghetto Brothers played, they only released one album Ghetto Brothers-Power-Fuerza in 1971. It’s become part of musical history. So have DJ Kool Herc’s block parties. They took place at 1520 Sedgwick Avenue. At these parties, DJ Kool Herc sampled parts of records, looped breaks and added his imitable “shouts.” This was the equivalent to Jamaican DJs toasting. Nobody had ever done this before. It was a musical first. That day, modern hip hop was born, and DJ Kool Herc was its founding father. However, it was Afrika Bambaataa, who was of the Zulu Nation collective that identified the four key elements of hip hop. Afrika Bambaataa believed DJing, MCing, B-boying and graffiti art were the four key elements of hip hop. It was only then, that many onlookers realised that there was more to hip hop that spinning records. That was the DJs role. MC-ing or rapping saw the MC rap or chant rhyming lyrics. B-boying was the breakdancing that accompanied the music. Graffiti art was either writing or drawing that were illegally painted on a public place. This was the ‘art’ of hip hop. Having identified the key components of hip hop and gone onto become one of the progenitors of breakbeat DJing, Afrika Bambaataa was about to join hip hop’s nascent hall of fame. During the eighties, Afrika Bambaataa took to spreading the hip hop message worldwide. By then, a new generation of hip hop artists were making a breakthrough. Fab Five Freddy starting hosting parties in New York in 1981. The same year, RUN D.M.C. were founded. The released their eponymous debut album in 1984. Run–D.M.C. was released to critical acclaim and commercial success. Then in 1985, his LL Cool J his Radio album, Just like Run–D.M.C., it’s considered one of the most influential hip hop albums of the eighties. That’s the case with Run–D.M.C’s Raising Hell and the Beastie Boys Licensed to Ill, which sold over ten million copies. Hip hop was no longer the music of the streets. It was big business. Rick Rubin realised this early on, and founded the Def Jam label in 1983. That was a shrewd piece of business. His label would release some of the biggest and most influential hip hop albums of the eighties. While Eric B. and Rakim’s Paid in Full was released in 1987, on one of Def Jam’s competitors, 1988 proved to be a good year for Rick Rubin’s label. Def Jam released Slick Rick’s The Great Adventures of Slick Rick and Public Enemy’s seminal album It Takes A Nation Of Millions To Hold Us Back. Full of social comment, It Takes a Nation of Millions to Hold Us Back sold a million copies in America alone. The album is now considered a hip hop classic. So would an album released by in another of Def Jam’s competitors. Tommy Boy were another of hip hop’s biggest labels. It had been founded by Tom Silverman in 1981. In 1989, Tommy Boy released De La Soul’s 3 Feet High and Rising. Not only did it reach number one on the US R&B charts, but was hailed a classic. Another of Tommy Boy’s releases was Queen Latifah’s All Hail the Queen. This landmark released was certified gold in 1990. That year, Public Enemy returned with another album bristing with outrage and social comment, Fear Of A Black Planet. Again, this Def Jam release was certified platinum. Another groundbreaking albums was A Tribe Called Quest’s People’s Instinctive Travels and the Paths of Rhythm. Given the success of hip hop during the eighties, hip hop was suddenly seen as a career choice. As a new decade continued, 1991 proved a vintage year for hip hop. Albums like A Tribe Called Quest’s The Low End Theory, Cypress Hill’s double platinum eponymous debut album and De La Soul’s De La Soul Is Dead were among the highlights of the hip hop released 1991. They were also among the biggest selling hip hop albums of 1991. However, 1991, was also the year a new production duo was founded. Jigmastas. DJ Spinna and Kriminul met, and founded Jigmastas in Brooklyn, This was the beginning of a long partnership for the DJ, producer-emcee combo. Their recording career began in 1995, when Jigmastas featured on Rude Rydims’ single Everybody Bounce, However, it wasn’t until 1996 that Jigmastas career began in earnest. That had been the case since the mid-eighties, when gangsta rap came to prominence. Many thought this glorification of the “thug” lifestyle would be a passing fad. It wasn’t. In 1992, Ice-T released one of the most controversial rap songs, Cop Killer. This caused outrage amongst the moral majority. The same year, 1992, Ice Cube released The Chronic. It proved an equally controversial album. Described as G-Funk, it glorified the use of guns, alcohol, and marijuana. According to purveyors of G-Funk, this solved any problem. While three million people bought The Chronic, politicians and the album’s critics weren’t impressed by what was among the most explicit gangsta rap ever released. However, this was just the start. The Chronic proved that what was explicit gangsta rap could prove commercially successful. After the success of The Chronic, West Coast gangsta rap came to dominate rap, and Death Row Records which released The Chronic, would become one of the most successful hip hop labels. Still hip hop was in a constant state of flux. There was a resurgence in interest of Mafioso rap, after the release of Raekwon’s debut album Only Built 4 Cuban Linx…in August 1995. Then in October 1995, Nas released Doe or Die. This pseudo Mafioso rap continued the glorification of the criminal lifestyle. To some extent, it was playing out before hip hoppers eyes. The East Coast-West Coast feud began in 1994. Suddenly, two of hip hop’s biggest names fell victim to the feud. Tupac Shakur was murdered in a drive-by shooting on September 13th 1996. The was just twenty-five. Less than a year later, twenty-four year old The Notorious B.I.G.died on March 9th 1997. Just like Tupac Shakur, he was the victim of a drive-by shooting. In the space of a year, two of the biggest names in New York hip hop were dead. By then, there was a new name in the New York hip hop block. That was Jigmastas. Although they had interested major labels, DJ Spinna and Kriminul decided to found their own label, They called this new label Beyond Real Recordings. It had been inspired by a track Jigmastas had just recorded. This was Beyond Real, the track that would introduce Jigmastas unique brand of boom rap to dancers and record buyers. Beyond Real was released later in 1996 with Dead Man’s Walk on the B-Side. It was an important single. Not only was Beyond Real Jigmastas’ debut single, but the first single released on their nascent label Beyond Real Recordings. There was a lot riding on the release of Beyond Real. Fortunately, when Beyond Real was released, it gave Jigmastas a minor underground hit. Surely a followup single would be released quite quickly to build on the success of Beyond Real? However, Jigmastas didn’t release another single until 1998. After two long years, Jigmastas returned with their new single Hip Hop. It was produced by DJ Spinna, and released on Jigmastas’ own label Beyond Real Recordings. However, after the release of Hip Hop, Jigmastas released a single on one of hip hop’s biggest labels. Last Will & Testimony was the second single Jigmastas released during 1998. It was released on the Tommy Boy’s Black Label imprint. Jigmastas it seemed, were going up in the world. Later in 1998, Soul Scream joined with Jigmastas to release an EP in Japan. Soul Scream’s contribution was Vibe; Jigmastas contributed the original and instrumental versions of All Day. For Jigmastas, that was the story of 1998. 1999 would prove just productive. During 1999, Jigmastas released another three singles. This included an EP with Defari. They both contributed three tracks. Jigmastas’ contribution was three versions of Let Me Hear It. Along with three version of Defari’s Blast, they were released on Tommy Boy’s Black Label imprint. After that, Jigmastas returned home to Beyond Real Recordings. To celebrate their homecoming to Beyond Real Recordings, Chandon was released as a single. On the B-Side was Iz You Dee. Chandon became Jigmastas’ first release on their Beyond Real Recordings since 1998. Later that year, Jigmastas hooked up with the then unsigned I.G. Off And Hazadous, to release an EP. Jigmastas contributed If, which featured Jigmastas’ new sound. Their music had taken on much more laid-back, mellow vibe. However, that would change with their next release. As the new millennia dawned, what would be one of the busiest and most productive years of Jigmastas’ career began. They were planning on releasing an all-star collaboration. This was their Lyrical Fluctuation E.P. 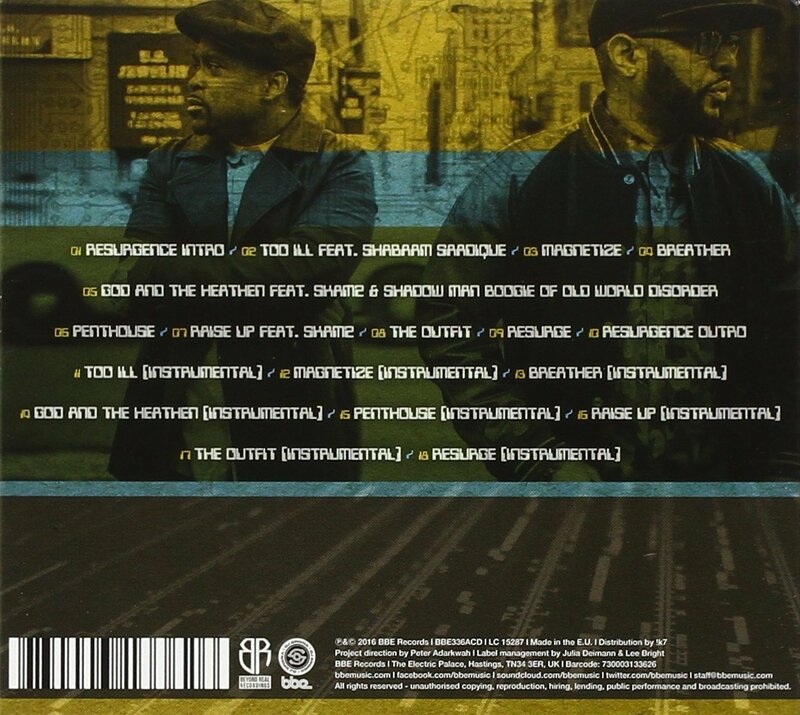 Mos Def, Mr Complex, Pharoahe Monch, Shabaam Sahdeeq and Talib Kweli all featured on the Lyrical Fluctuation E.P. However, what commentators and critics noticed, was that the two tracks Jigmastas contributed, featured a much tougher sound.It seemed Jigmastas’ sound was constantly evolving. That became apparent when Jigmastas released a compilation album Grass Roots “Lyrical Fluctuation” in 2000. It traced how Jigmastas music had evolved over the last four years, and showcased Jigmastas’ versatility and musical prowess. This was the perfect primer to Jigmastas’ music, as their continued apace. 2001 proved just as busy for Jigmastas. They released two singles and album. Their Infectious album was their debut album. It was released to critical acclaim and spawned two singles, Till The Day and Don’t Get Twisted. Both the Infectious album and the two singles were released on Jigmastas label Beyond Real Recordings, Just like Jigmastas, Beyond Real Recordings it seemed, was going from strength to strength. After releasing their debut album in 2001, Jigmastas released So What as a single in 2002. This was the only single they released. 2001 had proved to be an unusually quiet year for Jigmastas. Maybe 2003 should be different? 2003 saw things slow down for Jigmastas. They released On The Strength on the Las Vegas label HipHopSite.com Recordings. That was the last we heard of Jigmastas until 2015. On 14th August 2015, Jigmastas dropped a new single Magnetize. It was released on Beyond Real Recordings, This was just in time for the release of Grassroots-The Prologue-Deluxe Edition, which was released in September 2015. Grassroots-The Prologue-Deluxe Edition featured the music Jigmastas released between 1995 and 2003. During this period, Jigmastas were at their most productive. They combined Moog synth riffs, sliced and diced samples and Krim’s gravelly vocals. The result was some of the most important underground hip hop to come out New York during the nineties and noughties. However, this begs a question, what have Jigmastas been doing since 2003? The answer to that, can be found on Resurgence, a new album of previously unreleased material from Jigmastas. It features fifteen tracks which were recorded between 2003 and 2015. These tracks were recorded during a period when most critics thought that either the Jigmastas’ story was over, or the project was on hold. That is far from the case. Resurgence is regarded as a companion to Following closely behind last year’s expanded reissue of Grassroots-The Prologue-Deluxe Edition is the first of two albums Jigmastas plan to release during 2016. The other is a new studio album from Jigmastas. Resurgence is essentially a musical amuse bouche, and brings the story up to date. It ended somewhat suddenly in 2003. At first critics thought that the Jigmastas project was on hold. As time passed, it began to look as if the Jigmastas story was over. A few optimists thought that was still the chance of a new album from Jigamastas. However, they also think that Glen Miller is just running late. This time, though, the optimists have been proven right, and just like. They like many within the hip hop community, will welcome the return of Jigmastas’ new album Resurgence. Following the release of On The Strength in 2003, production duo Jigmastas continued to collaborate. However, none of these collaborations have been released until BBE Records released Resurgence. It features tracks that were recorded between 2003 and the present. They were produced and mixed by DJ Spinna, in Brooklyn, and became Resurgence, one of the most important albums of Jigmastas’ twenty-five year career. It had been thirteen years since Jigmastas had released any new music. Since then, the musical landscape had changed, and hip hop was a very different genre. So the album that announced Jigmastas’ comeback was without doubt, one of the most important of their career. Essentially Jigmastas’ career, reputation and very future was at stake from the moment they announced the release of Resurgence. Many musicians and groups had been in the same situation as Jigmastas. The major worry for any musician who had been away so long, was the worry that their music sounded hopelessly outdated. What if their music was no longer relevant? This could end up tainting their musical legacy. It could even affect their future, or even spell the end of their career. Jigmastas must have realised that all this was possible. Still, Jigmastas were determined to press ahead with release of Resurgence, their comeback album. Jigmastas were aware of the risks as they signed the contract to release their comeback album, Resurgence. However, Jigmastas were confident that even after thirteen years away, their music was still relevant and retained a contemporary sound. There was no way that Jigmastas believed the music on Resurgence was outdated. Instead, Resurgence was the next chapter in Jigmastas’ twenty-five year career. As the opening bars of Resurgence Intro opens Resurgence, one wonders what lies ahead? Have Jigmastas been away too long, or do they still have something to contribute? There’s also the worry that Resurgence sounds like a collection of tracks, rather than a cohesive albums. However, as the crunchy, mesmeric beats provide the heartbeat to this musical amuse bouche things are looking good. Quickly, the music becomes soulful, melodic, witty and sometimes, cerebral as Jigmastas showcase their usual brand of boom rap. DJ Spinna adds what are mostly laid-back and mellow backdrops; while Kryminul adds a series of raps. He dawns the role of storyteller, as he delivers lyrics that tell of life on the streets of Brooklyn. They’re akin to short stories that last between three to five minutes. Kryminul delivers his raps with emotion, passion, frustration and humour, as ducks and dives between subject matters. Meanwhile, DJ Spinna adds his trademark arrangements. Three of his finest laid back, languid arrangements can be found on Breather, Penthouse and The Resurgence. Especially, Penthouse’s arrangement with its jazz-tinged horns and ethereal harmonies. Resurgence Intro and Resurgence Outro which are both instrumentals which allow DJ Spinna to take centre-stage. He even adds an experimental sound to Resurgence Outro. This most likely comes courtesy of a tape being played backwards. It seems DJ Spinna has lost none of desire for invention on Resurgence. It’s an album which features a few of Jigmastas’ friends. This includes guest appearances come from Shabaam Saadique on Too Ill, which is one of the highlights of Resurgence. Then SKAM2 and Shadow Man Boogie Of Old World Disorder collaborate on God and the Heathen. Later, SKAM2 reappears on Raise Up, and swaggers his way through the track. The addition of Jigmastas’ friends adds a new dimension to Resurgence, the long awaited comeback album from Jigmastas. After thirteen years away, Jigmastas announce their comeback with Resurgence, which was released by BBE Records. Unlike most comeback albums, Resurgence is a collection of tracks that were recorded between 2003 and 2016. This could’ve gone badly wrong. It didn’t though. 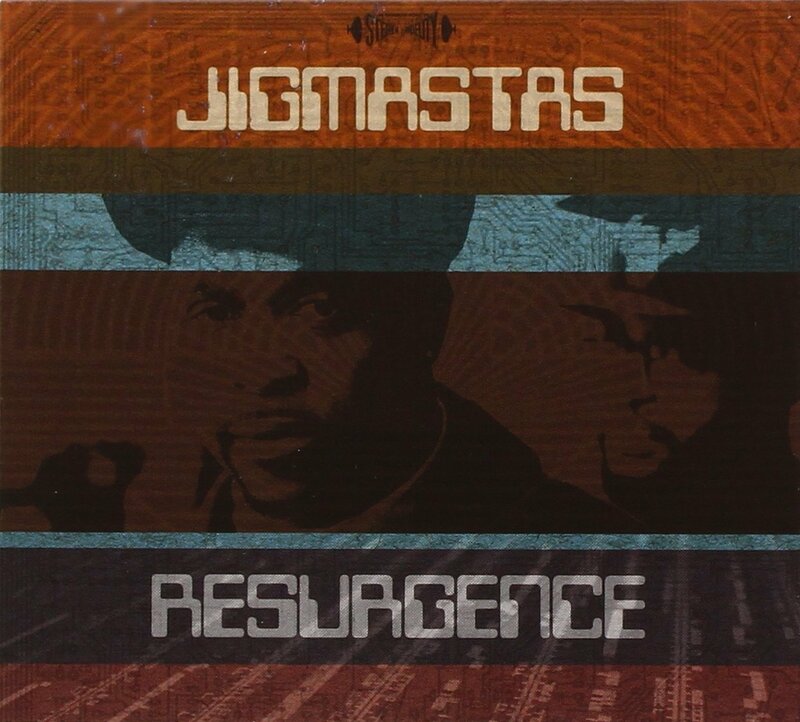 Resurgence shows that Jigmastas rate still relevant and still have something to offer music. There’s a soulfulness to much of Resurgence, with tracks that are melodic and lyrics that are thought provoking, witty, controversial and sometimes, cerebral. As usual, DJ Spinna adds what are mostly laid-back and mellow backdrops and Kryminul adds a series of raps. It’s a successful and long lasting partnership. The partnership began in 1991, and still going strong twenty-five years later. That’s a long time in hip hop years. Anyone who knows their hip hop history is sure to agree. Usually, hip hoppers have burnt-out; or are bankrupt or are in jail. Some have had to resort to third rate reality shows. Others are dead having died a brutal and bloody death. Still, though, Jigmastas are making music. Jigmastas are hip hop’s survivors, who after twenty-five years, continue to create their trademark brand of boom rap. It features on their new album Resurgence and their forthcoming album Stellar. However, Jimastas comeback album Resurgence, shows that they’re still relevant as they create music that’s laid-back, mellow, melodic and soulful. ← BIG STAR-THE GREATEST BAND YOU’VE NEVER HEARD.